Darshan Kang at a Liberal Party of Canada rally for the 2008 federal election. 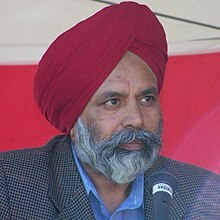 Darshan Singh Kang MP (born 1951) is a Canadian politician, currently sitting as an Independent in the House of Commons of Canada representing Calgary Skyview. He previously sat as a member of the Liberal Party of Canada caucus. Prior to his election to Parliament, he served as a Member of the Legislative Assembly of Alberta for Calgary-McCall from 2008 to 2015, representing the Alberta Liberal Party. Before entering politics, he was a welder and a real estate agent. Kang ran for office for the first time in Calgary-McCall in the 2004 Alberta general election. He was defeated in a closely contested race by incumbent Progressive Conservative MLA Shiraz Shariff. 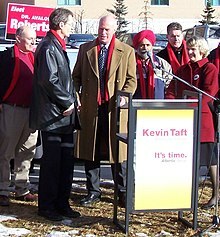 Darshan Kang (third from right) attends a news conference with Kevin Taft (third from left) in Calgary, as part of the 2008 provincial election campaign. Kang won his second bid for office in the 2008 Alberta general election. The election was a virtual rematch of 2004, with all of the same candidates running. Kang defeated Shariff by 98 votes, after returns in the advanced polls showed he had won overwhelming victories. Kang's numbers increased upon the official recount to 118 votes. Shiraz Shariff challenged the vote in court, claiming that the results of the advanced polling and special ballots was tainted, but the challenge was unsuccessful. In the 2012 provincial election, Kang was initially declared to have been defeated by Wildrose candidate Grant Galpin, but was later declared re-elected after all polling stations, special ballots and advance polls were counted. He declined to run in the 2015 provincial election in order to run for federal office. In June 2014, Kang was acclaimed as the Liberal Party's candidate for the riding of Calgary Skyview in the 2015 federal election. The riding had previously been Calgary Northeast, represented by sitting Conservative Devinder Shory. Kang ultimately won, narrowly defeating Shory. He and Kent Hehr are the first federal Liberals elected from Calgary since Pat Mahoney in 1968. On August 11, 2017, The Hill Times reported that Kang was being investigated by the House of Commons Chief Human Resources Officer for sexual harassment following allegations made by a female staff member in his Calgary constituency office. Pablo Rodríguez, the Liberal government whip, had referred the matter to the Chief Human Resources Officer after learning of the allegations. On August 29, 2017, the Toronto Star reported that the father of the woman claimed that Kang offered her a series of payments to not share details of the alleged harassment. On the same day, Kang took medical leave, citing the stress that resulted from the harassment allegation. On August 31, 2017, The Hill Times reported allegations by another constituency officer staffer of Kang's that he had kissed and grabbed her breasts without consent and had ignored her saying "no" and "stop". These allegations stemmed from Kang's time in the Albertan legislature. The same day, Kang resigned from the Liberal caucus saying that he wanted to focus on clearing his name and that he did not want the allegations to disrupt caucus work. In September 2017, David Khan, the leader of the Alberta Liberal Party announced that would investigate Kang's actions during his time as MLA. In March 2018, the report concluded that Kang's actions towards his former staffer violated the House of Commons's harassment rules. It found that most of her allegations were substantiated, including that Kang had misled her into entering his Ottawa apartment, where he touched her hands and tried to remove her jacket and massage her feet. It also found that Kang had later repeatedly attempted to enter her hotel room over her objections. Although the report found that Kang was unaware that his behaviour caused his former staffer discomfort, he should have known that his behaviour was offensive and unwelcome. The report was unable to substantiate the female staffer's claim that Kang had offered her money to stay silent because it was unclear who exactly had made the offer. After the report was released, Prime Minister Justin Trudeau announced that Kang would not be welcomed back as a Liberal MP. In the same month, the Alberta Liberal Party released new workplace policies that included a revamped complaints process and stricter policies to fight harassment in response to its investigation into Kang. Kang appealed the findings of the report to a legal panel, arguing that the investigation was unfair and the investigator was biased. On August 8, 2018, the panel accepted the investigation's report "without revision" and rejected Kang's appeal. "Provincial General Election of the Twenty-Eighth Legislative Assembly" (PDF). Elections Alberta. Retrieved 13 July 2015. The Report on the March 3, 2008 Provincial General Election of the Twenty-seventh Legislative Assembly. Elections Alberta. July 28, 2008. pp. 230–233. "Calgary-McCall Statement of Official Results 2004 Alberta general election" (PDF). Elections Alberta. Retrieved March 3, 2012. ^ D'Aliesio, Renata (March 8, 2008). "It's official: Liberal wins cliffhanger in McCall". Calgary Herald. Archived from the original on March 11, 2008. Retrieved March 14, 2008. ^ "Defeated Calgary-McCall candidate claims election tainted". CBC News. March 11, 2008. Archived from the original on April 5, 2008. Retrieved March 13, 2008. ^ Ferguson, Eva (April 24, 2012). "Liberal incumbent wins tight race in Calgary-McCall". Calgary Herald. Archived from the original on April 28, 2012. Retrieved January 28, 2018. ^ Wood, James (June 4, 2014). "MLA Darshan Kang to Run Federally as Liberal Candidate in Calgary Skyview". Calgary Herald. Retrieved October 5, 2015. ^ Howell, Trevor (October 20, 2015). "After 47 years, Liberals finally win seat in Calgary". Calgary Herald. Retrieved January 28, 2018. ^ Rana, Abbas (August 11, 2017). "House conducting investigation of sexual harassment allegations against rookie Alberta Liberal MP Kang". The Hill Times. Retrieved September 1, 2017. ^ Wood, James (August 29, 2017). "Skyview MP Darshan Kang denies sexual harassment allegations, goes on medical leave". Calgary Herald. Retrieved August 31, 2018. ^ Ballingall, Alex (August 29, 2017). "Liberal MP offered woman $100K to keep quiet about sexual harassment claim, father alleges". Toronto Star. Retrieved September 1, 2017. ^ "Calgary MP on medical leave after sexual harassment allegations vows to defend reputation 'at all costs'". CBC News. August 29, 2017. Retrieved August 31, 2018. ^ a b "Calgary MP resigns from Liberal caucus, denying sexual harassment allegations". CBC News. August 31, 2017. Retrieved September 1, 2017. ^ Rana, Abbas (August 31, 2017). "Former staffer levels new sexual harassment allegations against Darshan Kang". The Hill Times. Retrieved January 28, 2018. ^ a b "Alberta Liberals draft new workplace policies after sexual harassment complaints". Calgary Herald. March 5, 2018. Retrieved August 31, 2018. ^ a b Dippel, Scott (March 2, 2018). "Investigation finds Calgary MP Darshan Kang violated harassment rules". CBC News. Retrieved August 31, 2018. ^ a b Potkins, Meghan (August 21, 2018). "Calgary MP Darshan Kang loses appeal of harassment probe". Calgary Herald. Retrieved August 31, 2018. ^ "Trudeau says Calgary MP Darshan Kang dismissed from Liberal party". Global News. March 2, 2018. Retrieved August 31, 2018. ^ "October 19, 2015 Election Results — Calgary Skyview (Validated results)". Elections Canada. October 22, 2015. Retrieved November 4, 2015. Wikimedia Commons has media related to Darshan Kang. This page was last edited on 4 October 2018, at 07:16 (UTC).